Sorry everyone, I’m just way too happy now to post anything even remotely negative. Instead, allow me to regale you with home improvement tales. However, the point of this post isn’t to toot my own horn, but to encourage you to follow in my footsteps. Allow me to explain what happened. Then, I’ll convince you to do your next home improvement yourself too. We have several building inspectors in town. The head inspector (I’ll call him Gerry) is known for being strict. He is feared. I knew firsthand from an inspection last year. As a result, I admit to trying to game the system so that I get a friendlier inspector. This morning, I shuddered a bit when I saw the village truck pull up. Instead of my friendly inspector, Gerry was behind the wheel. Oh no. 30 seconds into the inspection, he pointed out that my pipe slope was wrong and I’d have to tear it all out. My heart fell through the floor. Hours of labor devoted to a drain was now down the drain. However, it turns out he was looking at the pipe from the wrong direction. It was OK. I stepped away from the ledge. He continued to quiz me on how I had tested both the supply and waste lines. I had done all of this and was able to explain the testing to his satisfaction. He then announced that I had passed and work could continue. Happy, happy, day. Let me back up a minute and tell you how I got to this point. We’re adding on to our home. We’ll have 2 additional bathrooms when the dust settles, so a big part of the job is plumbing. 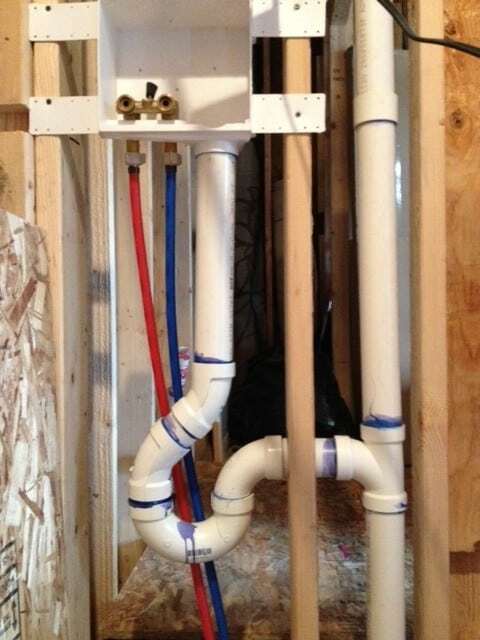 I called a recommended plumbing company for an estimate and it would have cost between $4,000 and $5,000 dollars. Ugggh. I then hit up the local library for a bunch of books on plumbing. I checked out the 5 best I could find and then substituted my nightly hour of pleasure reading with studying PEX, PVC and vent lines. I also must tip my hat to Mr. Money Mustache for his informative and encouraging post on PEX (supply line plumbing). Over the next 4 weeks, I plumbed my 2 new bathrooms and also a washing machine. Was it easy? No. Some parts of the job were challenging. I had to chip away concrete so that my waste lines would have the proper slope. I had to figure out how to get pipes wedged into tight spaces. I spent many, many hours crawling around the nasty crawlspace. Was it worth it? Completely. I now have thousands of dollars in my pocket that I would not have had if I hired someone. I also have a skill that I can apply over and over again. If a friend has a plumbing issue, I’ll be the first one to raise my hand (wrench?) and offer assistance. Hit up the library. There is a wealth of information waiting for you. Free classes at Home Depot: I was at my local HD just last Saturday when I noticed they were conducting a class on trim carpentry. Turns out, Home Depot offers a different class every week. Check this link for more information. YouTube: I don’t think YouTube has ever failed me. 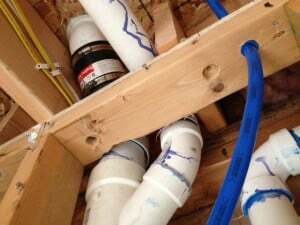 Here is a video on PEX clamp connections. Anything you could ever want to know is on YouTube. Google it: I had a lot of minor issues and questions. Google never failed me. Don’t be afraid: I know a lot of smart people read this blog. Trust me; gluing PVC together is a lot easier than doing taxes or writing code. Take your time: This is key. The first time you try a task, it may take you 4x as long as a pro. Don’t sweat it. No one remembers a job done fast; they remember a job done well. Be careful: Wear safety glasses and ear protection. Turn circuits off. Don’t cut your fingertip off with a table-saw. What is the worst that can happen? If you fail (you won’t), you can just hire a professional at that time. You’ll be set back a couple weeks. No big deal. What’s is the best that can happen? You’ll complete your job successfully. You’ll stare at your accomplishment with a beer in one hand, a huge smile on your face and a huge sense of gratification. You’ll have gained enough confidence to repeat the task and try others. You’ll save lots of money. You’ll be the envy of the neighborhood. Despite all of my big talk, I still get a bit nervous doing some of this stuff for the first time. It’s natural. Use your fear positively. Fear makes you more careful and try that much more to get it right. You may be a bit scared too fitting your first pipe or laying your first tile, but forge ahead! You can do it, I know you can. OK, enough blabbing. Drywall goes in on Monday and I have a swell trip to California in 2 weeks. Lots more to do! Congratulations! I love being able to look back at a DIY project and realize how much I’ve learned and how much value it created! Well done! I knew you would pass it . You strike me as a determined young man! Hopefully you will have lots of good years on your new “thrones”!!! That is impressive and you should be tooting your own horn! I recently hired a plumber after buying two snakes and failing to clear a kitchen clog. I could have rented the equipment, but when I priced that out, AND realized there was a leak due to a damaged drainage pipe, I hired a guy. When I redid my bathroom, the plumbing is the only part I hired out, mostly because I needed some people to install a cast iron tub. Worth it in the end. Bummed though that I didn’t unclog that sink myself though. I must admit, I do get a little jealous as a New Yorker reading about these awesome, satisfying DIY efforts that you and others have done on your homes. Sometimes, I like being able to call a landlord to take care of issues, but I do miss out on that satisfaction. Awesome work! We need to gut our bathroom and start over. 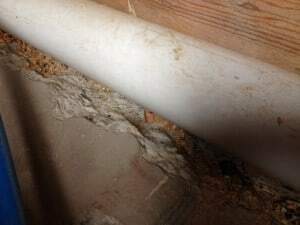 The thing that has me worried about DIY is the cast iron drain pipe that we either need to remove and replace or tie into with new stuff. I definitely want to try PEX. 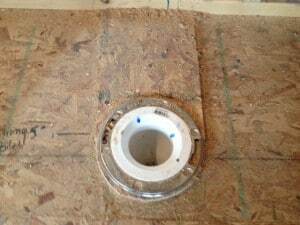 I saw that being installed on This Old House over the weekend. Well, you’ve boosted my confidence a bit. I’ll have to start gathering information and see what we can do. It would be really great to be able to stretch our money and get it done quicker than we’d be able to save up thousands of dollars to hire someone. Jen @ Jen Spends recently posted…How did I get so lucky? Well done! I haven’t done many DIY projects lately myself due to some time constraints but have 2 bathroom remodels coming up next year. It’s gotta feel good for you to start seeing the light at the end of the tunnel with your projects. Awesome! I bet you’re glad to get that out of the way! I’ve done a few jobs myself but I wussied out on the plumbing when we had our bathroom put in. In all fairness it only cost £400 or something like that which seemed fair enough to me. We did all the painting, decorating and tiling though! Tiling was a lot easier than expected! I’ll definitely try some plumbing next time the need arises. I love getting to try some DIY stuff out. The sense of accomplishment, especially if you were clueless going into it, is fairly unmatched. Congrats on passing! Heck of accomplishment and that much closer to the final goal! Once the “guts” like the plumbing are finished, things should accelerate into the finish line! Enjoy the trip out to Cali! Congrats on passing! I totally understand what you mean about the grumpy inspectors. We had one when we redid our roof and he actually had the nerve to comment on a few lumps in the shingles for aesthetic reasons – and if anything caused the lumps it was the extra layer of felt that we put on underneath the shingles that we technically didn’t have to but our gradient was just on one side of the threshold so we did it to be safe. He couldn’t fail us for the lumps, but man did he want to. All it took was a month or so of summer heat and the lump flattened out as they should. Besides, it was on the back roof deck! It’s only visible if you’re in a plane flying over our backyard! Congrats on passing. Once I bought rental property, I had to get knowledgeable on how to fix and improve stuff. or hire it out. If someone was going to make $50 to $100 per hour, it might as well be me. Saving $100 is better than making it. the saving is tax free. No Nonsense Landlord recently posted…What is the right price for your rental? Kudos for doing this project yourself! I finished up the last of remodel job in my bathroom and know very well the satisfaction of DIY work as well as the savings involved. I agree with all of your advice. Not being afraid, going to the library and google and youtube are your best friends. Congrats on being so amazing! I’ve been trying to convince the bf to start thinking of some of the upgrades we can do the house ourselves! It’s difficult but rewarding! Thanks for documenting your journey! So awesome, Mr. 1500. I only dabble in DIY, but can at least admit it’s mostly because of a fear of the unknown. Like you said, the thing you really need is a willingness to try. may i know what toilet model you are using in your home? how much are they? ill be glad to hear from you soon.